Take a 75 -minute panoramic guided tour on-board a double decker bus. The city tour includes the downtown historic district, Toyota Center, Convention Center ,Minute Maid ball park, Market Square, Buffalo Bayou, City Hall, Heritage Society park, Mid town and more. 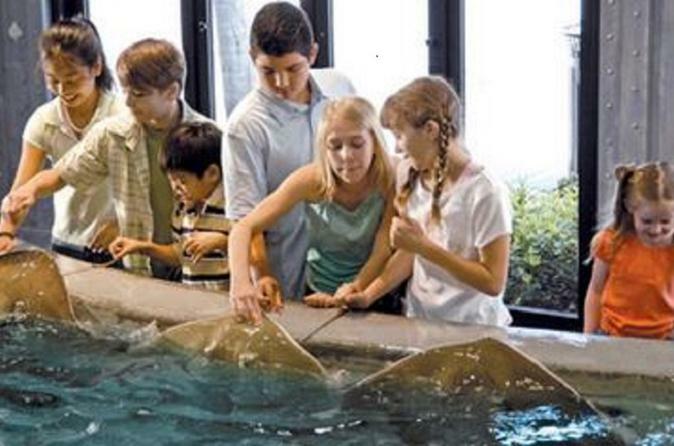 After your guided city tour, enjoy admission to the downtown Houston Aquarium exhibits and rides. This bus tour is a wonderful way to start your Houston vacation. This lightly narrated 90-minute tour showcases Houston's famous land marks, historic Houston areas, and breathtaking views. Explore the great city of Houston and see what the largest city in Texas has to offer. This guided tour drives through Houston's beautiful Market Square and many more downtown locations including Buffalo Bayou, Allen Parkway, and Houston's upscale midtown residential area. You will enjoy the breathtaking billion dollar downtown Houston skyline and museum district. Once the city tour is complete, you will be dropped off at the Houston Aquarium which you are welcome to explore and enjoy. This package includes one admission ticket for the Houston Aquarium and one ticket for the Houston City Tour.